Jennifer Iserloh, author of “Secrets of a Skinny Chef”, believes that the essence of good health springs from your own kitchen. You can eat the foods you love by cooking them the healthy way to satisfy both body and soul! She celebrates delicious, easy to prepare dishes that can be enjoyed for a lifetime, reinventing meals that grandma would be proud to serve. As a trained chef, author and health cooking celebrity, Jennifer has created thousands of delicious recipes, articles, and blog posts for TV, print and web publications including The Today Show, Living Well With Montel, SELF, Health Monitor, Prevention, In Style, People, First For Women, AOL, The Huffington Post and Livestrong. 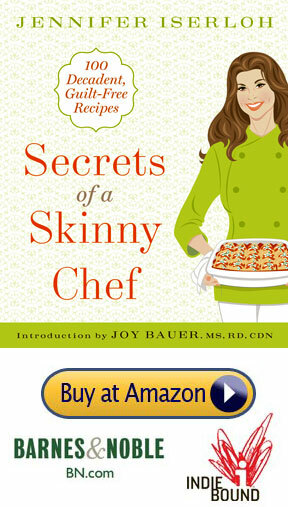 In addition to her own books, Secrets of a Skinny Chef (Rodale, 2010), Yoga Body Diet (Rodale, 2010) and Active Calorie Diet (2011), she was also the recipe developer for Joy Bauer’s Food Cures (2007), Jessica Seinfeld’s Deceptively Delicious (2007), Double Delicious (2010), and as well as and Elisabeth Hasselbeck’s Deliciously Gluten Free (2012). After graduating with honors from the Institute of Culinary Education in 2003, she went on to work in kitchens throughout Manhattan. Through her internships, she worked with Tyler Florence of the Food Network on his cookbook “Eat This Book” and shortly after secured a job as a private chef for Annie Leibovitz. 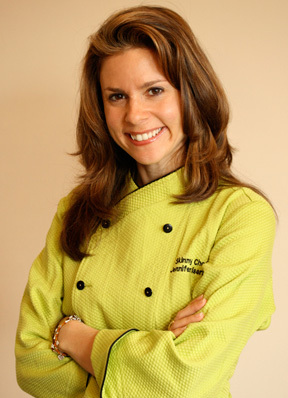 As a certified yoga teacher and former private chef for several other internationally known celebrities, she continues to teach people to make comforting meals healthier and healthy fare tastier – including on her Livestrong Woman’s YouTube Show Healthy Cheats, her website skinnychef.com and social media (@SkinnyChef). Jennifer’s mission is to empower people to take on a bigger role in their own health, cook the dishes they love, and enjoy life more. That’s why she launched her 200-Calorie-Fix Healthy Eating Program providing delicious 200-calorie options for breakfast, lunch, dinner and snacks.